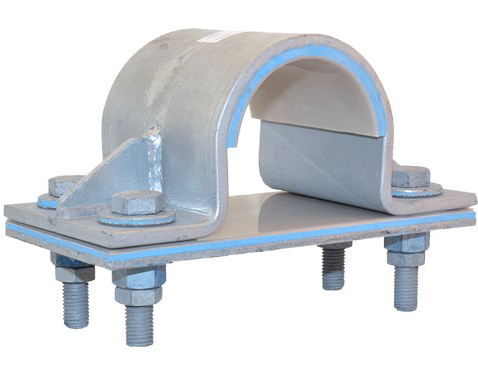 APP’s VibraTek Hold Down Clamp is the premier solution to problems associated with vibration in piping systems. Our proprietary VibraTek liner is constructed to absorb vibration from compressors and reciprocating equipment to prolong the life of your piping system. We incorporate specialized fiber-backed Teflon to the VibraTek lining to add a low-coefficient of friction to its vibration dampening qualities. In addition to our VibraTek line, we can also line our clamps with your choice of lining materials, from Urethane and Neoprene to sodium etched Teflon, there is no limitation to our services. APP’s VibraTek Hold Down Clamps are precisely fabricated to 1/32 of an inch. APP’s VibraTek Hold Down Clamp liner is molded to the inner diameter of the clamp for a consistent thickness and precise fit. APP HB-Teflon has glass fibers embedded on the bonding side, which eliminates the problems traditionally associated with adhering Teflon. Maximum Compressive Strength 20,000 lbs. The VibraTek will not harbor moisture due to its hydrophobic and non-porous properties, significantly reducing the occurrence of corrosion.